CONTROLRadioUK #IfWeLikeIt #WePlayIt: Coronation Street Review: "Family Drama"
Coronation Street Review: "Family Drama"
What would Coronation Street be without beginning with an argument over a bird feed?! Sally is ever so proud of herself whilst Yasmeen very much isn't, and talk soon turns to how brokenhearted Sophie has been left by Kate and Rana's relationship. And of course they happen to pass by this conversation so Sally makes a quick exit with Yasmeen following. Things soon get serious though. Rana is wondering whether Imran has heard from their parents, and Zeedan chimes in with talk of how they should be locked up for what they tried to do to her. Rana doesn't want to hear any of this, but it's hard to argue Zeedan doesn't have a point. What they did to Rana was wrong, they could come back at any moment and try something again, and the fact that Rana still wishes things could be different does leave her vulnerable. Later Kate catches up with Rana in the cafe and is shook. She explains that word of their relationship is starting to spread which has angered her parents and she wants to talk to them. Understandably Kate doesn't think that's a good idea and is even more worried for Rana than she was before, and you just know where this is leading. There's just a few tiny issues here. Kate still isn't really grasping the true reality of the consequences. When Rana explains their relationship news is spreading, she sees that as a good thing, when obviously it isn't. In the cultural that Rana is from, shame is a very true and in some cases deadly thing. And of course Rana continuing to ponder reaching out to her parents isn't good, especially when she's dismissing Zeedan and Kate's concern. Her feelings are completely understandable as she is still processing the events of last week, but it isn't at all surprising that Kate does bite the bullet and contact the police over Rana's mother. She and Zeedan are seeing Rana's parents as being the very real threat that they are, but of course ignoring Rana's wishes is going to land Kate in her bad books. Turning ones backs on their parents isn't an easy thing at all, especially when you are still desperately wishing that things would be different, and perhaps Kate would've been better served to just let Rana deal with this her own way but she's very much in protective mode right now. Being face to face with her father, Rana attempts to reason with him. First she denies any involvement in her arrest and then points out they did try to ship her off. Hassan is still resolute that they were just trying to do what is best, and that Rana has brought shame on them & lied to everyone around her for months. Their actions aren't at all excusable but considering most of the kidnap fallout has been about Zeedan's restaurant (who really cares about that), I'm glad we're now getting scenes between Rana and her father & as warped as it may sound, I'm glad he isn't remorseful. This storyline is helping bring awareness to an extremely warped culture that many do unfortunately go through. As much as Rana would love for her parents to come round and accept her, that just wouldn't be realistic to how these things go in real life. Still doesn't make him wishing Rana had never been born easier to hear though. 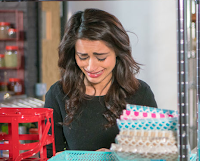 After her father's gone, Rana is soon storming into the restaurant where she confronts Zeedan in front of Alya and Imran for having her mother arrested. Zeedan of course denies it, Imran is off to the station to get her released and Zeedan & Rana are soon snipping at each other as Kate arrives and is forced to speak up. Whether intentionally or not, this scene does draw some interesting parallel's to how Zeedan discovered Kate was the one Rana had been having an affair with. They are after all back in the kitchen (albeit not the bistro) and Kate is still uttering that infamous 'It was me' line and in as uncomfortable a circumstance as before. Kate & Rana are soon having a fight in the street where Kate decides to give Rana some space, she decides to go to the station to make things right, and Zeedan is soon telling Robert he's never been better. Because really, when your ex is upset and apologizing for falsely accusing you and you've just witnessed her fight with her girlfriend, you do start to wonder how you can slide in. When Rana returns to the restaurant with Imran and is offering to be a helping hand, the wheels are just spinning in Zeedan's head. He and Rana are soon being playful like old, friendlier times when Kate interrupts and Rana is still justifiably angry with her. Kate walks away with her head between her tail as Rana points out she isn't considering her feelings. Alone Rana is thanking Zeedan for his support and bemoaning everything she has lost, and of course Zeedan is saying that she should be with someone that makes her laugh not cry and this leads to him kissing her. They are of course interrupted by the new waitress but this scene is extremely problematic & it goes get even worse when Zeedan later claims Rana is just confused and doesn't know what she wants. This is of course all sowing the crumbs for the next storyline coming their way, but the writers could've and should've done a better job. It is extremely well known that soaps will have characters do things that are, well out of character, to progress a storyline. It had been known beforehand Zeedan would get the wrong idea from being a shoulder to cry on, but there's no denying Rana responded to that kiss for a moment. It was probably down to the shock though. She wasn't at all expecting Zeedan to do that and well, when someone unexpectedly kisses you it does take a minute to respond. This is of course all to setup the next storyline coming their way, but the writers should've done much better here. It's a common trope with characters, you have an argument with your partner, so of course you'll share a moment with your ex. Be it a straight or LGBT couple it's cheap, tacky, completely expected behaviour from a soap, but still massively dissapointing here. Coronations Street have done so well with this storyline so far and this is perhaps the first mis-step. It serves it's purpose though as Zeedan is soon telling Kayla that Rana is his wife and dismissing her relationship with Kate as confusion at not knowing what she is. You can't deny though that Zeedan used Kate & Rana's fight to his advantage, because he is the type of character to seize on emotional distress as a way of getting a person back. Rana very much has other ideas. She's eventually making her way to the Bistro where she and Kate do make their peace because they're literally incapable of staying mad with each other. Rana does look a little scared when Kate questions what was going on in the kitchen, and it won't be long before she is confessing. But for now Kate is once again apologizing, commenting on how difficult the situation is for her since Rana is still living with Zeedan and his wife, and this isn't a situation that can go on for too much longer on both ends, and Rana does reassure Kate that she does love her and whilst she may have lost everything, she wouldn't change it at all. I think this is also a message for us viewers, reasserting the fact Zeedan is completely barking up the wrong tree and there is no love triangle incoming. Elsewhere Audrey is soon filling Sally in on David's relationship status, and moving Emma into the house, and they're then spotting Yasmeen in the garden. She very much isn't here for the bird feed and I can't honestly blame her because birds are vicious. Sally is soon once again bringing up Sophie's hurt and Yasmeen is rightly questioning what on earth that has to do with things. It quickly escalates to Audrey being knocked over during their fight over the bird feet, and those that say Coronation Street still doesn't have those comedic aspects we all know and love are clearly watching a different soap. Even at the hospital, Sally and Yasmeen can't stop snipping. Very much at the end of her tether Audrey sends Sally off and soon has Yasmeen off in search of the fit Doctor whilst she adjusts her make-up. A start of a new romance is very much on the horizon. Elsewhere Simon was very much feeling down in the dumps over the new babies arrival at the Rovers. It's an understandable feeling most children go through, but his anger leads to him setting Summer up for a fall. Toyah is soon video messaging Eve for support, and Peter arrivals home to inform her Simon has been bunking off school. Toyah is soon forced to spin Peter another web of lies to keep him off her scent. Simon however has to deal with the fallout of his actions as Summer is left devastated that her crush doesn't fancy her, and Simon is put in his place by his lovely new friend. Simon is soon having to answer to Peter, who really isn't getting the fact that Simon's behavior is an act of rebellion. After Simon apologizes, Toyah gives him some advice on his new friendship. Shona meanwhile is trying to help Billy and Summer build bridges. She realizes Summer is angry because she feels let down and is on hand to point out parents do make mistakes. It's quite a parallel to Rana's situation in effect. Shona is reassuring Summer that your parents might mess up but that doesn't stop them loving you, and poor old Rana is dealing with parents who have messed up and very much don't love her.